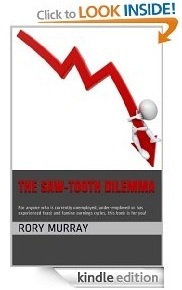 My first book, The Saw-Tooth Dilemma is now published on Amazon - You can read it on PC or Mac, as well as Kindle and if you persuade me, I might send you a free copy! It analyses the lessons of a 25 year career in IT and Telecoms, 10 years as a freelance consultant and offers a lot of insights into how to build a robust opportunity pipeline that will keep you in lucrative work long-term. For the price of a burger, this might provide you with insight that will literally make you millions of £ or $ over the coming years . . . It worked for me! Million Dollar Networker is a site I created to explain how Social Media and Networking actually works. Over a beer one night I worked out that networking has brought me over $1m of business. On this site I share how I did it and some of the tips and tricks that will help your business. Million Dollar Networker's Twitter account @milliondollarnw - Please feel free to follow. Rory Murray Twitter account @rorymurray - Please feel free to follow. In this interview, Rob and I discuss "Gravitas" in the context of Social Networking - how to create and manage it and how it can benefit you. Just click on the image of Rob's book (left) to download the interview as a podcast (25Mb)....... If you'd rather stream it, click here. You can check out the whole of Rob's series "7 Laws of Personal Gravitas" HERE. If you want to buy his excellent book from Amazon just click here. Atholl Consulting website - a technology strategy consultancy. My Plaxo Profile - please connect with me - it's a great tool for managing your connections!